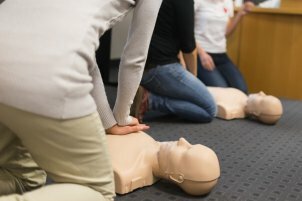 Need a BLS Class in Kansas City? This course is the American Heart Association BLS Class for Healthcare Providers taught in a local Kansas City classroom. This Basic Life Support course is the required CPR class for healthcare and medical professionals that covers CPR and AED for adults, children, and infants. You Need to Renew Your BLS. You Need to Certify in BLS for the 1st Time. You Need an American Heart Association BLS Certification for Your Job. You Need a BLS for Healthcare Providers certification for a school program. *This CPR Class Satisfies CPR Requirements for Students in Healthcare and Medical Related School Programs. Click BLS Class in the Calendar below on your desired date. Complete the Registration Form. You will be emailed a confirmation receipt and complete course details. Students in Healthcare or Medical Programs, such as Nursing School. Anyone That Needs to Satisfy CPR Requirements for an Employer or School Program. Course for BLS Renew and 1st time BLS. Click BLS Class in the Calendar on the desired date. *NOTE: The American Heart Association updated the BLS guidelines so this course satisfies both 1st Time BLS students and BLS Renewals. How long is the BLS Class? The BLS Class is 3.5-4 hours long. Yes, the the American Heart Association requires that every student has the BLS for Healthcare Providers manual. You can purchase one at checkout if you don’t have access to one.